The Weekend Edition is pulled from the daily Stansberry Digest. The Digest comes free with a subscription to any of our premium products. Whether a serious bear market begins later this year as our founder Porter Stansberry has warned... or the "Melt Up" runs for another 18 months or more as our colleague Steve Sjuggerud has predicted... we believe stock market volatility is likely to remain elevated in the months ahead. In fact, as Steve has pointed out, the last Melt Up in the late 1990s saw market-leading tech stocks soar more than 200% over the last year and a half of the rally. Yet these same stocks fell roughly 10% – similar to the sharp correction we've seen this year – on five separate occasions over that time. And along the way, the market's "fear gauge" – the Volatility Index ("VIX") spiked above 25 more than 10 times. History is clear: Melt Up or "Melt Down," last year's historic tranquility is unlikely to return anytime soon. "The new safe haven is now volatility," said Christopher Stanton, chief investment officer at California-based Sunrise Capital LLC. "It's the one thing that's pretty much guaranteed." Mr. Stanton is among those who are buying futures contracts pegged to the VIX, a profitable bet if volatility continues to rise. In the past two weeks, both hedge funds and asset managers have been doing the same, according to data from the Commodity Futures Trading Commission. These speculative traders are known as the "dumb money" for a reason. They tend to be wrong at extremes. When they're all making the same bet – whether they're all super-bullish or super-bearish – it's a sign that the trade is "crowded" and a short-term reversal is likely. As always, today's extreme doesn't mean the VIX can't move higher in the near term... And again, we continue to expect volatility to trend higher in the months ahead. But speculators are suddenly super bullish, which suggests the greater risk is to the downside today. Profiting from a rising VIX is notoriously difficult under the best conditions. Even during periods of elevated fear and volatility, the VIX doesn't remain at highs for long. It spikes and falls – often dramatically – before spiking again. 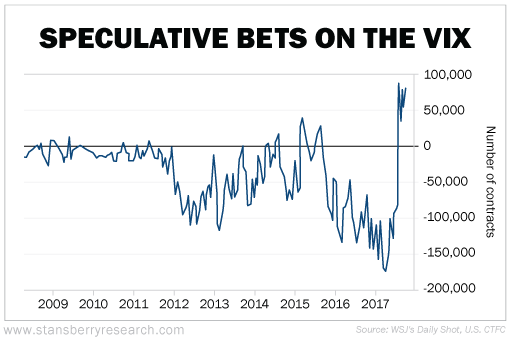 Meanwhile, the two primary ways to bet on a higher VIX – buying futures contracts directly, or buying exchange-traded funds ("ETFs") that own these futures – have a significant cost. Due to the nature of these contracts, they tend to lose value over time. This means you can actually bet correctly and still lose money if your timing is off. Today, the odds are stacked even further against you. If you're interested in speculating, be sure to keep your position sizes small and don't risk anything you can't afford to lose. Switching gears, you've likely heard about the controversy surrounding social media giant – and Stansberry's Investment Advisory portfolio recommendation – Facebook (FB). In short, news broke last month that London-based data-analytics firm Cambridge Analytica had gained access to – and improperly used – the personal data of more than 50 million Facebook users as part of an effort to influence the 2016 U.S. presidential election. The news got even worse earlier this month when Facebook said the real number of users affected by the breach was closer to 87 million. And of course, this news follows the company's admission last fall that Russian-backed operatives had exploited its site to try and influence the election as well. The stock is down about 15% from its February highs... and the company has lost roughly $100 billion in market value in the process. The big decline has left some folks wondering if the company's best days are behind it... and whether it's time to sell. We sell when we hit our stop or when the story changes. Neither has happened in this case. Our fundamental thesis for owning Facebook shares remains intact. And we still see the stock as a solid investment over the longer term. In spite of the controversies surrounding Facebook, the world continues to log in. Billions of users continue to interact with each other, sharing stories, "liking" photos, and consuming content from companies, movies, musicians, and other advertisers. They're not leaving en masse. Facebook is too big of a part of their daily lives... And for most users, there's really nothing else like it. You see, as we explained in our December 2016 recommendation, Facebook's business possesses the most powerful "network effect" we've ever seen. Its business gets better as it gets bigger. The more users who log in to Facebook and share their stories and photos, the more attractive the website is for that next user to join. And as more consumers join the site, more information is shared, and so on. And of course, the more users, the more valuable their data and eyeballs are to advertisers. Growth begets more growth. Momentum increases. And the winner tends to take all – or at least take most. That's what has happened with Facebook. It is the clear winner in the social networking space (at least, outside of China). With more than 2 billion monthly active users, it's many times more popular than the next largest competitor. And that makes Facebook an incredibly powerful economic engine and cash-flow machine. Facebook's scale, growth, and profitability are truly in a class by themselves. And so as long as the news flow isn't so bad that a substantial number of users delete their accounts, we will want to own shares. Sure, we hear isolated anecdotes of "this advertiser leaving" or certain user groups pushing for change (including a #deletefacebook campaign that appears short-lived). And that might slow profit growth and soften user metrics, causing continued choppiness in the stock over the short term. While Porter and his team believe Facebook will fully recover from this controversy, there is no denying that data breaches like this are becoming incredibly common... And increasingly costly. "Hacking" already costs the global economy more than $450 billion a year. At its current pace, this figure could grow more than tenfold over the next decade. And no one – not even the government itself – is immune. In fact, there's virtually nothing any of us can do to fully prevent getting hacked today. You see, several notable cybersecurity experts believe blockchain technology – yes, the same blockchain technology that powers bitcoin and other cryptocurrencies – could put an end to computer hacking and identity theft once and for all. Even better, the Stansberry's Investment Advisory team has identified one tiny company in particular that is leading this revolution. They believe buying this stock today could be like buying online-security company Check Point Software Technologies (CHKP) at the start of the Internet boom... before it soared from $4 to more than $100. Click here for all of the details. Editor's note: Less than 1% of people around the world use blockchain today. But in a few years, experts predict it will become a $3.1 trillion market. And early investors could make a fortune by betting on the right companies. Learn more about this coming tidal wave right here.